LORIENT --- French President Nicolas Sarkozy today attended the "unveiling" of the frigate Aquitaine, the first of eleven new FREMM multi-mission frigates on order for the French Navy, at the DCNS shipyard here. He was accompanied by Defense Minister Hervé Morin, Industry Minister Christian Estrosi, the Chief of Defence Staff, Admiral Edouard Guillaud, the Delegate General for Armaments, Laurent Collet-Billon, and the Chief of Naval Staff, Admiral Pierre-Francois Forissier. "Shipbuilding, both civil and military, is a strategic sector for our country. France has extensive know-how in this field that it will not let go,” Sarkozy said. The FREMM program is Europe’s largest naval program, and is led by France in cooperation with Italy. It is managed by OCCAR, the Organisation for Joint Armament Cooperation . The program aims to renew the French Navy’s fleet of anti-submarine and anti-aircraft frigates. The French part of the program consists of nine anti-submarine warfare (ASW) frigates and two anti-aircraft (FREDA) frigates, bringing to eleven the number of FREMMs ordered for the Navy. All these frigates will be named for French regions (Aquitaine, Normandy, Provence, Brittany, Auvergne, Languedoc, Alsace and Lorraine). Overall, the Franco-Italian program calls for delivery of 21 frigates to the two countries. FREMM Multimission frigates will form the backbone of the French surface fleet for the long term. They are designed to operate in joint and combined operational theaters. Displacing 6,000 tons and with a length of 142 m, the FREMM frigates can reach speeds of 27 knots, are crewed by 108 people, and are heavily armed with Exocet 40 Block 3 anti-ship missiles, Aster air-defense missiles and MU90 torpedoes. The first nine frigates, designated ASM, will have enhanced capabilities for deep strike when the Future Naval Cruise Missile enters service in 2014. The 2 FREDA are designed to protect a carrier battle group or an amphibious group against aircraft and missiles. All FREMMs will operate an NH90 helicopter, and carry special forces troops and their equipment. Construction of the eleven FREMM will generate, up to 2022, very significant business turnover for DCNS (mainly at its site at Lorient, but also at its facilities at Brest and Cherbourg) and for many sub-contractors, mainly SMEs. The build rate, selected according to the multiyear defense blueprint, combined with anticipated export orders, is expected to maintain DCNS’ industrial workload. “Today, I am visiting a company that has a full order book for the next four years. The FREMM program gives DCNS visibility for the next 10 years or more,” Sarkozy said. “Our goal is not to maintain employment at DCNS, but to increase it,” he added. Regarding exports, one FREMM sold in Morocco is currently under construction [for delivery in 2013—Ed.]. Other countries such as Algeria, Saudi Arabia, Greece and Brazil are also potentially interested. The third frigate, "Normandy", ordered for the French Navy, will go into production in September. 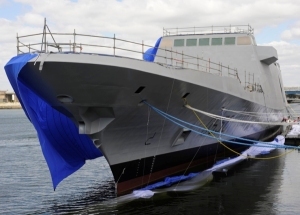 LORIENT, France --- DCNS revealed the frigate Aquitaine, the first of the European FREMM multimission frigate programme, at a ceremony attended by French President Nicolas Sarkozy. Over 1,000 people witnessed the event at DCNS’s Lorient centre, the home of excellence in French surface combatant construction for almost 400 years. DCNS will build a batch of 11 FREMM frigates with deliveries scheduled to begin in 2012 and continue until 2022. FREMM frigates – among the most technologically advanced and competitively priced on the world market – give DCNS a world-class product and an opportunity to increase international sales. These vessels are designed to face all threats from air, sea or land. To meet the current and emerging needs of the world’s navies, DCNS has combined innovation, versatility, modularity and evolvability. Drawing on state-of-the-art technologies, the DCNS-designed FREMM combat system can accommodate the latest weapons, subsystems and equipment. The combat management system (CMS) software represents over 5 million lines of code. The main weapons include naval cruise missiles offering a deep-strike capability and MU90 torpedoes with a range of several tens of nautical miles. The sensor suite is designed around the Herakles multifunction radar with a range of more than 250 kilometres. These highly automated surface combatants require a complement of just 108, or less than half the number required to man earlier generation vessels with similar capabilities. The hybrid propulsion system uses both electric propulsion and a gas turbine to achieve a range in excess of 6,000 nautical miles. In electric propulsion mode, a FREMM frigate offers a level of acoustic discretion approaching that of a conventional-propulsion submarine. FREMM frigates also combine versatility of operational deployment with excellent interoperability for missions with joint and allied forces. France has ordered 11 FREMM frigates. The contract for the first eight vessels was signed in November 2005 and another for remaining three on 30 September 2009. Italy plans to acquire ten and has placed firm orders for six. The Royal Moroccan Navy has placed an order for one FREMM frigate giving DCNS an important success in international sales and bringing the total number of FREMM frigates on order to 12. The French FREMM programme represents an unprecedented industrial challenge in European naval shipbuilding with the contract calling for the delivery of one vessel every ten months. Note also that even at this rate, DCNS has the resources to accommodate new orders from international customers without additional delay. The Aquitaine is scheduled to be delivered to the French Navy in mid-2010. Overall, the French FREMM programme will provide 50 million hours of work. To meet this challenge, DCNS adopted new work methods that have enabled management to bring core expertise tasks back under the Group’s own roof where cost-competitive. Success in this area hinges on achieving unit costs comparable with those of low-cost shipyards undertaking part contract work. The Group is thus re-integrating work that would otherwise go to subcontractors and, in so doing, kick-starting a virtuous circle of more in-house work, more efficient industrial resources, lower production overheads per unit output and more jobs at established centres. This approach is a good example of the transformation programme that DCNS is now implementing under the Championship strategy to improve Group performance by 30% over the next three years. DCNS is a leading European player on the world market for naval defence systems. The Group designs, builds and supports surface combatants, submarines and mission-critical systems and equipment incorporating the most advanced technologies. Drawing on dedicated teams, proven expertise and extensive industrial resources, DCNS is also expanding into new markets in civil nuclear energy, marine renewable energy and naval and industrial services. DCNS is committed to sustainable development and was one of the first defence contractors to achieve Group-wide certification to ISO 14001. The Group employs 12,000 staff and generates annual revenues of around EUR 2.5 billion.